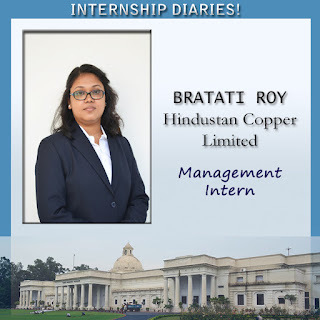 I got the grand opportunity of doing my internship from Hindustan Copper Limited (HCL), Kolkata, a public sector undertaking under the administrative control of the Ministry of Mines, is the nation’s only vertically integrated copper producing company. I worked on the project which pertained to build up the Marketing Strategy for Nickel. HCL, being known for manufacturing Copper from the stage of mining to converting to commercial products, decided to manufacture a new metal, Nickel, by recycling their by-products. I handled the responsibility of analyzing market of nickel, its usage in industries and strategic approach of its competitors in India. I was mentored by two esteem personalities, Mr. Jayanata Mukherjee, Chief Manager, Marketing, HCL and Mr. Saurabh Chaturbedi, Asst. Manager, Marketing, HCL. I feel myself extreme fortunate to get the guidance of them. I was factually treated to be the business analyst of HCL instead of just an intern. I got break of attending meetings with the production managers and team, discussing with managers about the approaches to make the effective strategy so that HCL can have the benefit of penetrating the existing market of Nickel in India. This internship at HCL has given me hands-on experience of working as a business analyst in real time business environment. By and large experience was incredibly elevating and gave me immense buoyancy by the end of 2 months at HCL.